Our youngest was away with family for the week, so we decided to brave the 100°F plus temperatures and the Midwest’s worst drought in fifty years, and go spend a couple of nights by Table Rock lake. 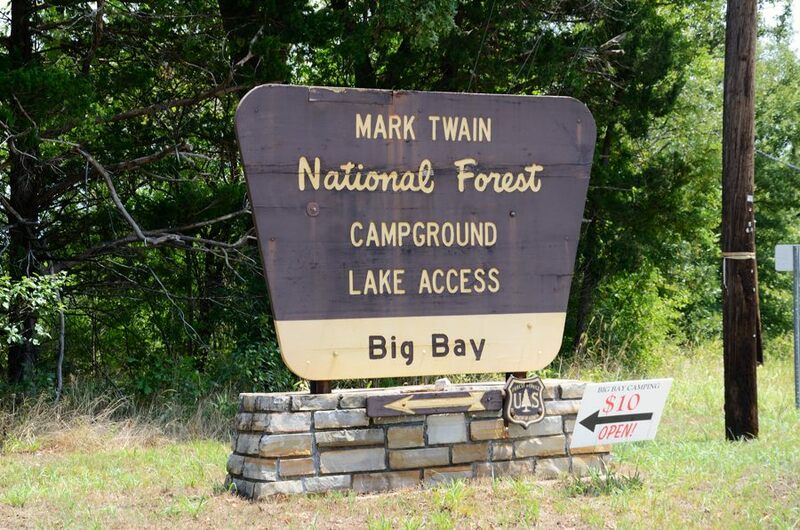 Update: Unfortunately the Big Bay Campground on Table Rock Lake is now closed. You can read on to find out what Big Bay was like and see what future campers will be missing. When we are going car-camping we tend to just throw everything we think we’ll need in the back of the van and rely on our remembering between us what needs to be taken along. Once in the van we’ll play a game of ‘did you remember?’ which was why, five minutes after we’d left home we were heading back to collect the pack of sodas left on the kitchen table. Ginger dashed in to pick up sodas, and in the process startled the big kids who were busy relaxing at the thought that the ‘parental unit’ was gone for a few days. Out in van, I carried on playing the game. A few seconds later I could be seen rummaging in the garage for our car camping chairs. Forgetting sodas or chairs was not a major problem. Unlike the time, car camping in the winter, I put our sleeping bags to one side to discourage the cats from using them as beds, barfing, or scratching zones, and we each assumed the other had put them in the van. We only discovered the omission when we were one hundred miles away, with night rapidly approaching, and a tent, sleeping pads but no sleeping bags. Some hasty phone calls, cooperative kids’ friends and a round trip of another one hundred and fifty miles resolved the situation, but I’m still to this day wiping at the egg on my face. The drive to Big Bay campground was uneventful, which is always good news, especially with two kayaks strapped to the roof of the van. 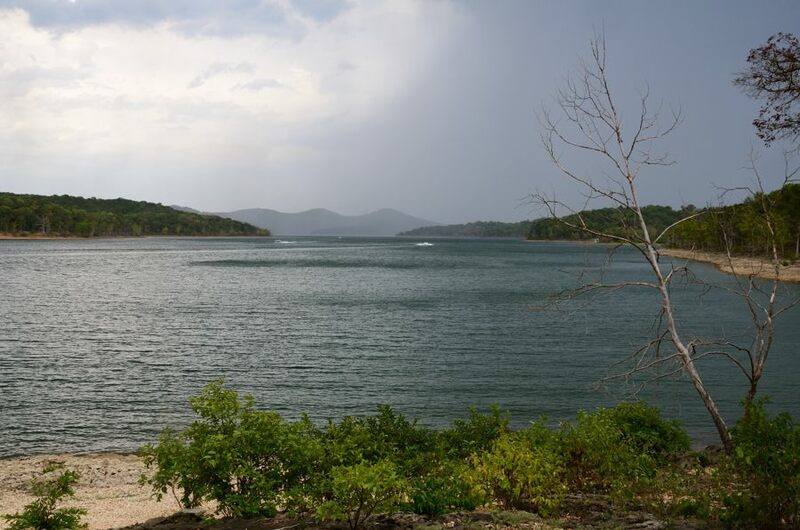 We had decided on Big Bay a) because we like it there, b) because we wanted to reconnoiter a site for a Persieds camping trip latter in the month, and c) based on what we’d heard, Table Rock Lake was likely to have more water in it than Stockton. BThe toilet blocks house flushing toilets. In this loop at least, they are in need of some TLC, as they are very scruffy inside and the Ladies only has one functioning lavatory. That said the supplies were in place, they are lit at night and everything was clean. It was hot. So hot, we decided to postpone unpacking the van and pitching the tent. Instead we grabbed our chairs and sat by the lake. There were boats buzzing around and to the north a huge easterly moving thunderstorm entertained us. Pretty soon it started to rain, and then to rain hard. Sitting in the van while the storm passed I said “We should have brought the canopy.” A phrase that was going to become a running joke throughout our stay. We’d discussed it, and Ginger didn’t want to mess with setting it up so we left it home. A canopy is great for keeping the picnic table dry, provides excellent shade, and generally makes a campsite look like ‘home’. Missouri is experiencing a fifty year record drought. When we finally decide to brave the heat and go camping it starts to rain. The rain didn’t last for long, and we spent the evening watching as the storm kicked up wind sending breakers against the shore. Normally that’s the preserve of the wakes from the motor boats. I’ll gloss over the quick trip into Shell Knob to get some salad dressing to replace the bottle left at home in the fridge. That night, climbing the hill to the campsite, I encountered a phenomenon I’d never seen before. The dew point was so high our breath was smoking. I’m used to that in the winter, but on a hot summer’s night? Overnight the storm rolled over us and we were treated to the sound of rain falling on the tent. I love that sound. The next day was hot again. We sat by the lake, and floated around in it to cool off. There were some surprisingly cold spots which must have been caused by seeps from the previous night’s rain. We went kayaking. Only a couple of miles but quite enough in the heat. I scooped huge dollops of water out of the lake with my hat and doused myself in an effort to keep cool. Big Bay campground runs all around the ridge to the right. Returning to camp after kayaking we disturbed a villainous squirrel who had chewed his way into our food box. We arrived just in time, as there was only a few teeth marks to be seen in the bread destined to be the wrapping of my bacon and eggs breakfast in the morning. The lesson here is even in broad daylight and shut away in a plastic food box, our food wasn’t safe from the critters. We expect raccoons or even bears to try and get our food. We weren’t prepared for hungry squirrels. One bit his way into our food box and proceeded to feast on a loaf of bread. Fourtunately we returned to camp before he got more than a nibble at the bread that was to be the wrapper around by eggs and bacon breakfast the following day. We also noticed that there were hundreds of Daddy Longlegs (Opiliones, aka harvestmen) around. These harmless creatures were swarming into the gaps in the bark of the trees. That is, those that hadn’t taken up residence under the fly of our tent. In the evening building clouds over the hills to the east made for a spectacular moonrise over the lake. Behind us to the west we could tell a huge storm was brewing. There was the sound of distant, and not so distant thunder, and the lightning was lighting up the clouds that were building up above us. When the storm hit, it rained hard and the wind picked up so much we semi-jokingly discussed the best plan should there be a tornado. A concrete vault toilet in the day use area would be the best bet if you had enough time to get to it. The modern vault toilets are, in my opinion, built like bomb shelters and have a lot of room inside too. Once more I slept to the wonderful sound of rain on the flysheet of the tent. So much for the dry hot drought conditions we expected. Friday morning, while I emptied the rain water out of the kayaks, and enjoyed a morning swim and float in the lake, Ginger talked to the Camp Host and manager Jim Travis. As we expected, he said that the camping season had been very quiet and there had been a poor turnout this year. I hope it picks up for him once it begins to cool off. Our Ascend kayaks on top of the van, campsite No. 27, Big Bay Campground.